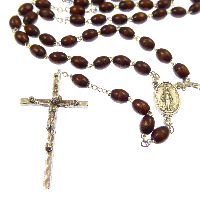 Please browse our different categories of rosary beads. We have a wide selection to suit all needs. 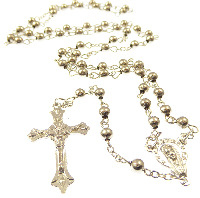 Rosary beads are a set of prayer beads and the devotional prayer itself. It combines silent or vocal prayer and mediation. 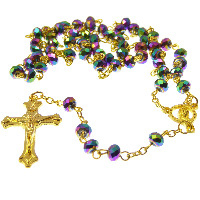 The prayers are repeated sequences of the Lord's prayer and then ten prayings of the Hail Mary, followed by a single praying of Glory be to the Father. This can be accompanied by the Fatima prayer. Each of the sequences is known as a decade. 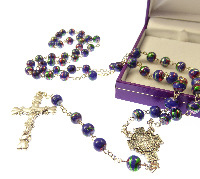 All of our rosary beads are 5 decade rosary beads. 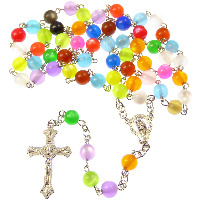 We have glass rosary beads, wooden rosary beads, knotted cord, plastic rosaries, resin, lasso lazo wedding and unique rosaries such as coffee bean beads. 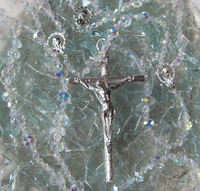 All of the rosaries in this section come in a beautiful organza gift bag for a special touch and make them all an ideal gift.